Toyota Australia Prius c’s $23,990 starting price makes it the cheapest hybrid powered car in Australia by $6K. Based on the Yaris platform, it’s also the smallest, by a margin of similar magnitude. “Prius c combines a compact exterior, spacious interior, desirable features, engaging driving dynamics, advanced technology and five-door hatchback utility with aggressive pricing,” said Toyota Australia executive director for sales and marketing Matthew Callachor, as quoted in a press release. 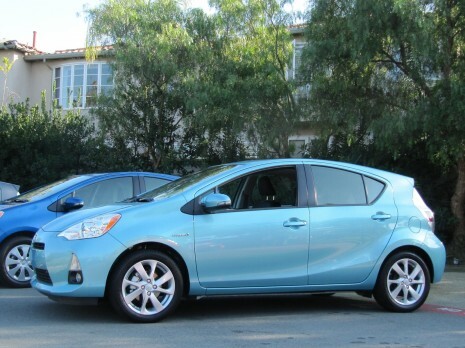 The Prius c uses a substantially updated version of its larger sibling’s hybrid drivetrain. Both specs of Prius c – base and i-Tech – use the same 74kW Hybrid Synergy Drive unit, combining a 1.5 litre Atkinson cycle petrol engine, an electric motor and a 144V NiMH battery pack. All specs feature an electronically controlled CVT gearbox. Motors and transaxle, radiators and power control unit have been repackaged to fit into a smaller engine bay. The engine shares the second-generation Prius’s 1.5-litre displacement, but the overhaul for the c is sufficient for the company to describe the engine as ‘about 70 per cent new’. The primary aims are weight loss and compactness, with the new unit carving 14 per cent of total weight, from 243kg to 201kg. Reflecting the overall difference in weight of up to 285kg between the c and the larger hatch, it’s been cut from 168 to 120 cells, resulting in 25 per cent reduction in weight from 42kg to 31kg. They’ve managed to fit it under the rear seat, next to the 36-litre fuel tank, giving the little car 260 litres of cargo space. Like that of the bigger Prius, the drivetrain offers different, switchable drive modes. EV allows a couple of kilometres of all-electric drive at up to 40km/h; Eco mode helps cut energy consumption by governing the throttle and air-conditioning unit. Predictably when looking at it as a high-tech, high-spec Yaris with a commensurate price premium over the standard petrol model, the base c comes equipped with keyless entry and start, seven airbags, height and reach adjustable steering, a TFT-screen multi-information display and soft-touch steering wheel switches for audio, climate control and MID readouts. It also has cruise control, hill-start assist and a 6.1-inch touch screen display for audio and other functions, including a reversing camera. A $3K premium for the $26,990 Prius c i-Tech adds alloy wheels, self-levelling LED headlamps with washers, privacy glass, folding wing mirrors, a bigger rear spoiler and upgrades to the steering wheel, audio, seats and interior trim.